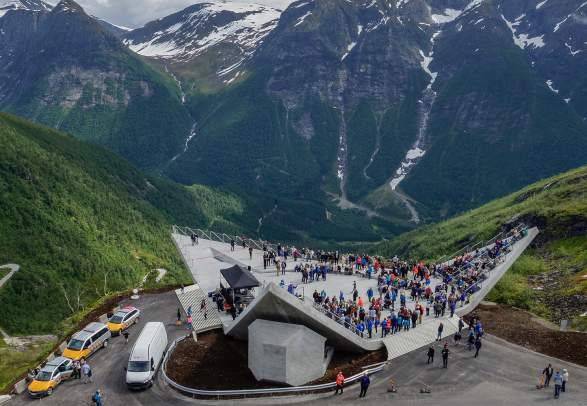 In 2016, the Norwegian Trekking Association (DNT) opened an architecturally different self-service cabin. 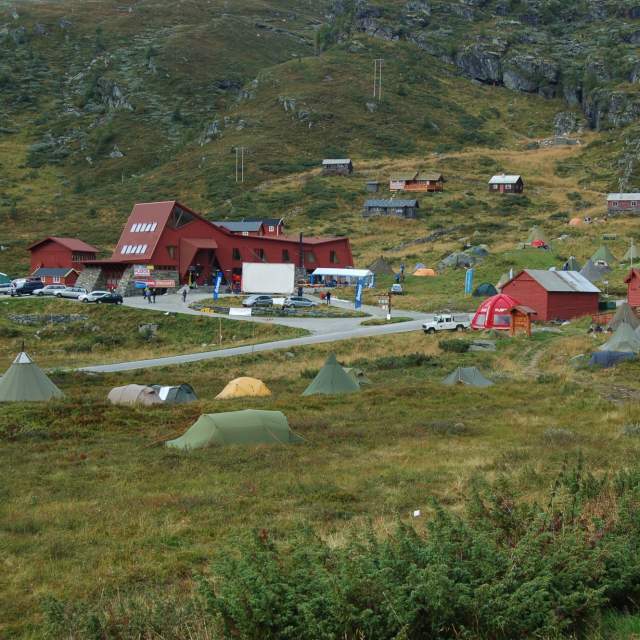 The small group of ultra-modern cabins called Skåpet serves as the gateway to the trail network in Frafjordheiene on the south side of Lysefjorden. “The mountains here are cool. I saw a little frog on the way up here. It made me yell so loud that my mom thought I saw a snake”, says nine-year-old Rikke Benaglia Petersen with a chuckle. “We spent about an hour and a half coming up here. We’ve gone on a lot of hikes in the mountains and we think it’s fun”, says Rebecca. Across the country, DNT own, operate and uphold more than 550 lodges and cabins. The overnight guests are from all over the world. 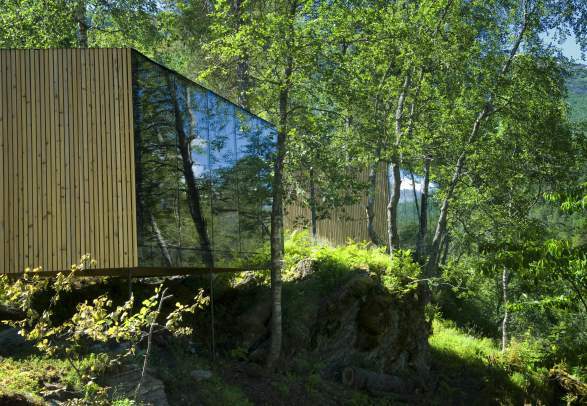 The cabins have long been associated with traditional, solid timber construction with small-paned windows and grass on the roof, but Skåpet represents a new generation of cabins with modern architectural designs featuring large windows and zinc clad walls. 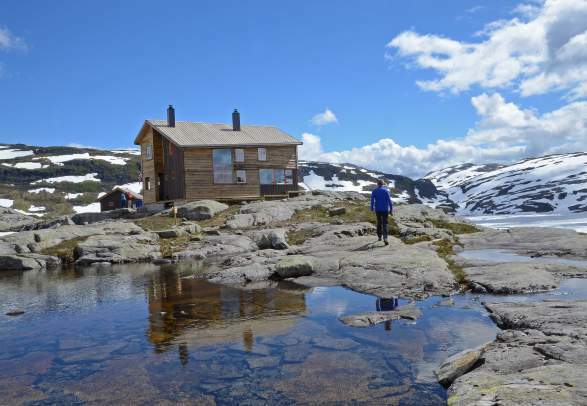 In addition to the main cabin that has a common room, a kitchen, and sleeping quarters for twelve people, you’ll find a sauna with an outdoor shower, outhouses with toilets, and six smaller cabins for sleeping. Each of them has enough space for you (and four other guests) to have some peace and privacy and to comfortably enjoy the mountains through the large floor-to-ceiling windows. 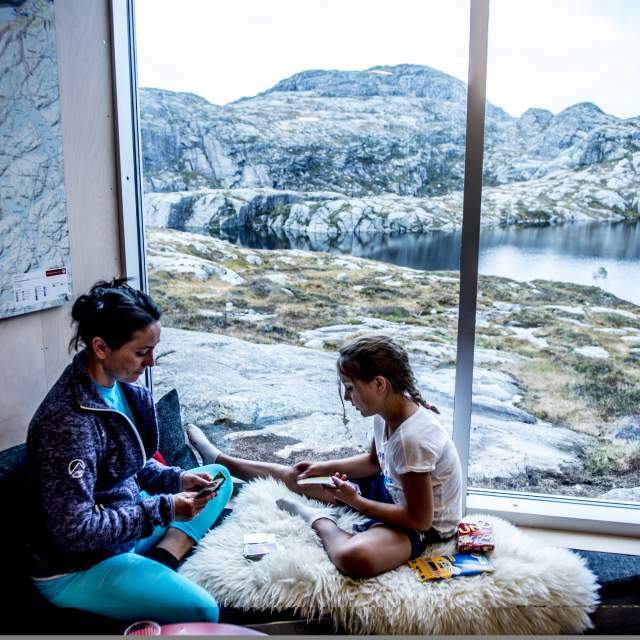 It started with the reconstruction of Turtagrø Hotel in Luster in 2002, and with the building of the new lodge Preikestolen fjellstue in 2008 came a new way of thinking about the construction of lodges and cabins, according to the manager and chief of natural resource management at the DNT, Anne Mari Aamelfot Hjelle. “Nationwide, we have observed that the architecture has had significance for both the attention garnered and the number of visits the cabins receive”, she says. The DNT is behind many of the cabin projects, and there are multiple forces pulling together which has caused the number of new, modern architect designed cabins to explode. The initiatives involving innovative thinking come from those who own and operate the cabins, and all this increased attention has clearly helped to inspire others. 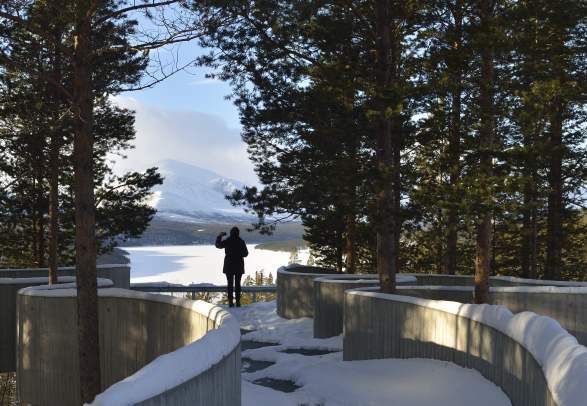 At the same time, “Norway has many good architects who know the time is right”, Hjelle says. The DNT aims to get more people out on hikes whilst also taking care of nature. 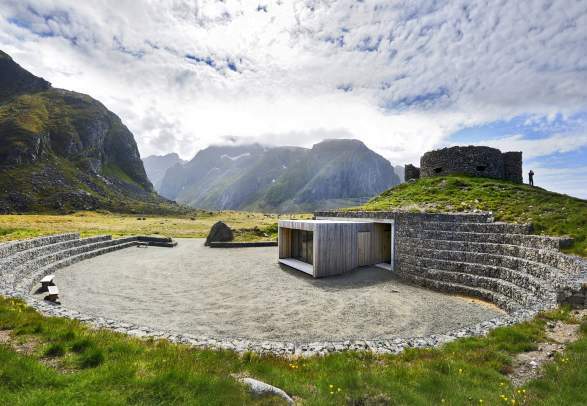 Therefore, when new building projects occur in Norwegian nature today, careful consideration of the environment, energy solutions and choice of materials, along with functionality, all play a key role. “These are structures that are closely linked to nature, and which take into account the environment in which they are placed”, says Aamelfot Hjelle. 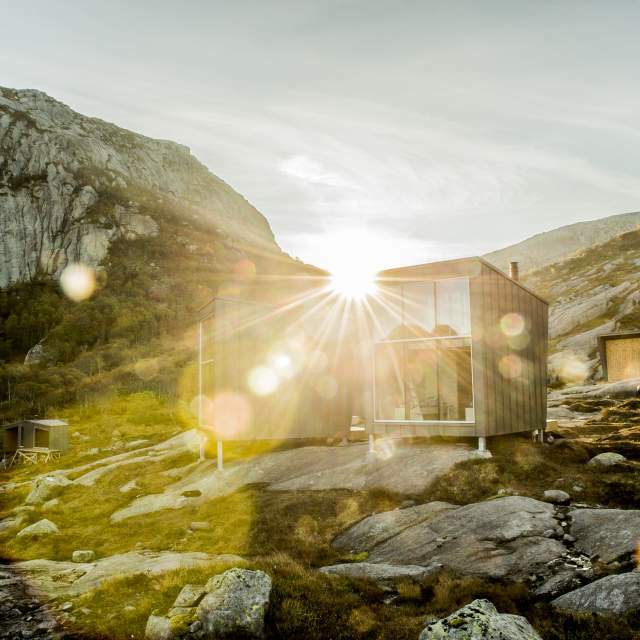 It doesn’t go unnoticed when cabins with a new twist pop up, and this has sparked debate about tampering with the romantic image many people have of traditional Norwegian mountains. And that’s good, in Hjelle’s opinion. She stresses, however, that consideration of the local population and sustainable tourism weighs heavily, and that the Tourist Board would never initiate construction projects that are unwanted locally. 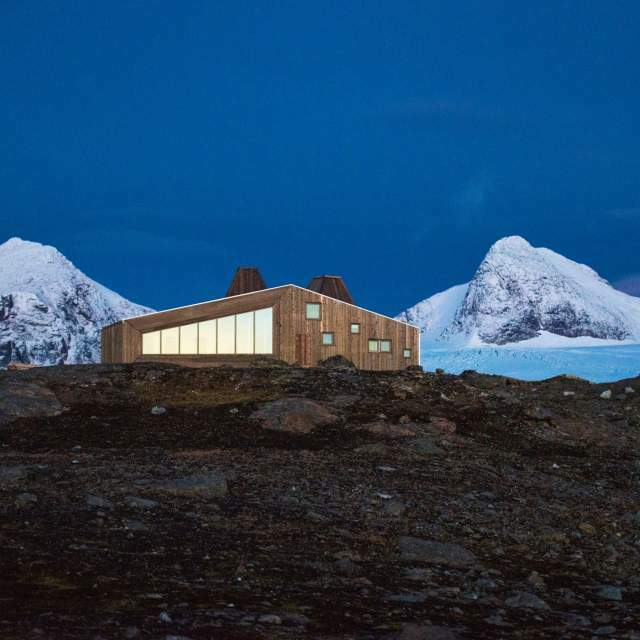 Many of the new cabins have already become icons, and the Rabothytta cabin on the north side of the Okstindbreen glacier in Hemnes in Helgeland is a good example. DNT’s cabin number 500 has become a place many now make the journey to see.
. At the same time, it is not a goal in itself for the cabins to be innovative, and the DNT will not only be building this type of cabins in the future”, Hjelle emphasises.
. At the same time, it is not a goal in itself for the cabins to be innovative, and the DNT will not only be building this type of cabins in the future”, Hjelle emphasizes. More architect designed cabins are already on the way. 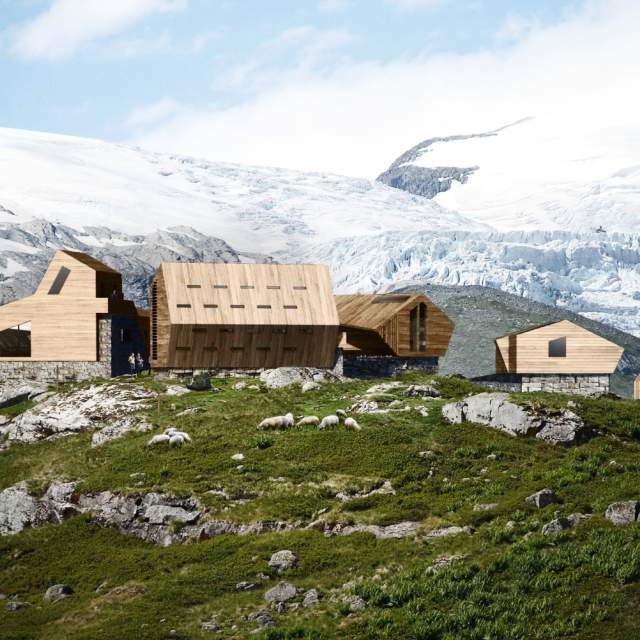 When the Tungestølen lodge is rebuilt after being ravaged by a hurricane in 2011, it will be in a design created at the architectural firm Snøhetta. 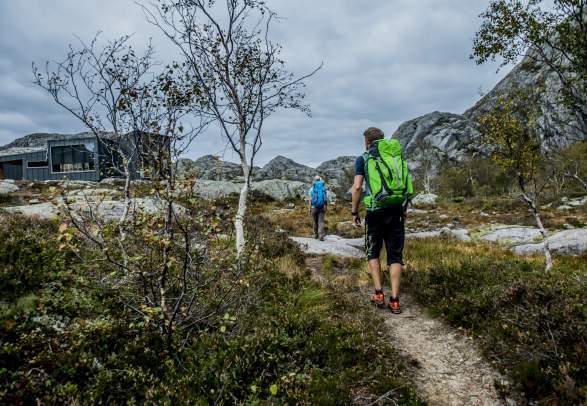 It is also essential to convey that the cabins are there to provide shelter and that guests can feel safe, warm and protected from the often harsh Norwegian climate. At the same time, the surroundings must not be shut out, and Tungestølen has, like so many of the new cabins, a large panoramic window. Anne Cecilie Haug also tells us that technological developments make it even easier to build using low-impact methods in Norway’s outlying areas. In other words, it is easier to protect the environment these days, even when building far off the beaten track. The senior architect also finds it fun to create an alternative to the traditional cabins and likes the idea that you can experience something that was made specifically for the space where they are located. “We at Snøhetta love working with the philosophy that what we create will be open to everyone and that no one is excluded, no matter who they are”, Haug says.